Nothing quite compares to a diamond. But how can you find the diamond that's perfectly made for you and also appropriate to your budget? As a direct diamond importer and manufacturer, we specialize in the sale of certified diamonds between one and ten carats. Visit our public showroom or explore the diamonds in our online jewelry store and you will experience The Diamond Vault difference. This is where exceptional quality meets excellent value. That' because we're committed to providing below New York wholesale-price diamonds while ensuring that our customers are offered the best combination of color, clarity, cut and carat weight for the money. Our knowledgeable brokers and cutters possess over 50 years of combined experience in the diamond trade and are highly skilled in the production of jewelry. The Bridal Fashion Collection—Scroll over any ring image to examine every elegant detail of the setting, as well as the center and side stones. The S. Kashi & Sons NY Collection—The designs will impress you. 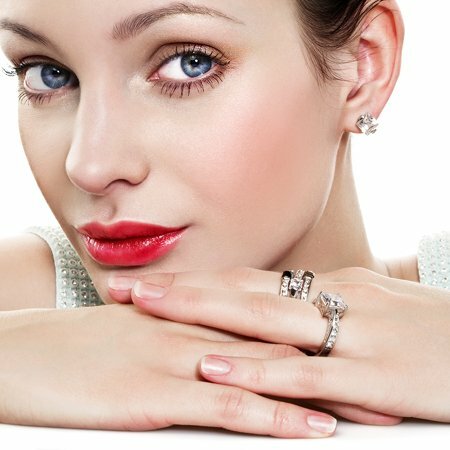 The wholesale jewelry prices will convince you. Gents’ engagements and wedding bands— Choose from all-metal settings or bold diamond rings, in contemporary or traditional designs. Our Designer Collection—The Diamond Vault is proud to present diamond rings of unsurpassed distinction and boldness. Customize your favorite ring through your choice of setting, including platinum or 14K white or yellow gold. Any vendor in hundreds of generic jewelry stores can sell you a diamond ring. However, only expert jewelers can explain the attributes, cut, clarity, color, and carat that distinguish one precious diamond from another. At The Diamond Vault, we've made it our mission to offer all who visit our site a comprehensive education in diamond knowledge. We also believe that you shouldn't have to wait a lifetime to enjoy something you'll cherish your whole life long. That's why we offer some of the friendliest and most affordable financing available.